I’ve been repeating the same lunch lately but I haven’t showed it to you on the blog. I’m not having this every single day, but when I don’t have leftovers it has become my go-to. I present to you: my version of the snack plate. It’s not revolutionary, I know. But I am loving the variety and satiation this provides me! I cover all my bases with veggies, protein, fruit, and a little healthy fat. Then you’ve got your sugar snap peas, carrots, and cherry tomatoes for veggies as well as some sliced raw tempeh (<3) for added protein. All of these to be dipped in hummus. 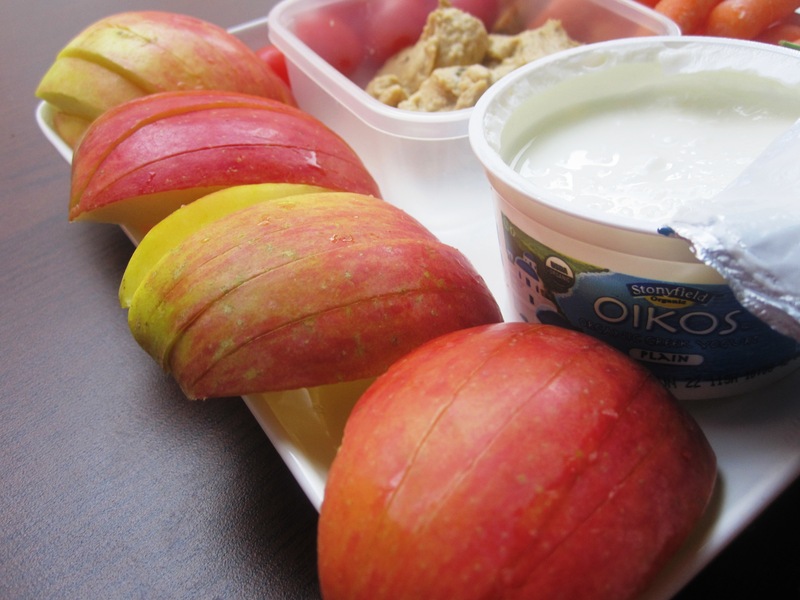 I love munching and crunching through my lunch, alternating bites between sweet and savoury. It’s totally easy to throw together the night before and and incredibly refreshing mid-day break on a hot summer day. I just love it! What’s your favorite lunch lately? What’s normally on your snack plates? I LOVE IT!! so many flavas and textrues! Snack plates are the best! My favorite lunch right now is random salads, that usually contain spinach as the base, other veggies, tuna/eggs/beans for protein and then a grain from supper leftovers with hummus on top! 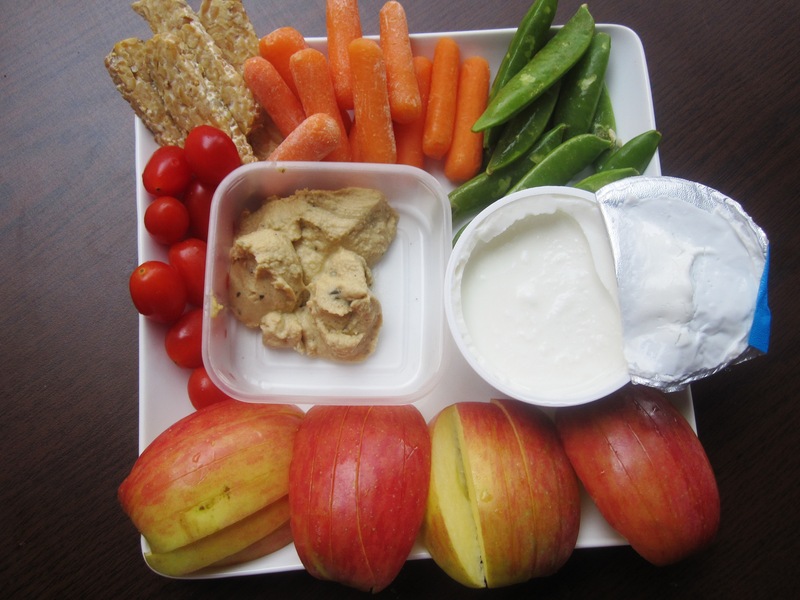 My snack plates usually contain apple & pb, veggies, crackers and hummus! Love your lunch! 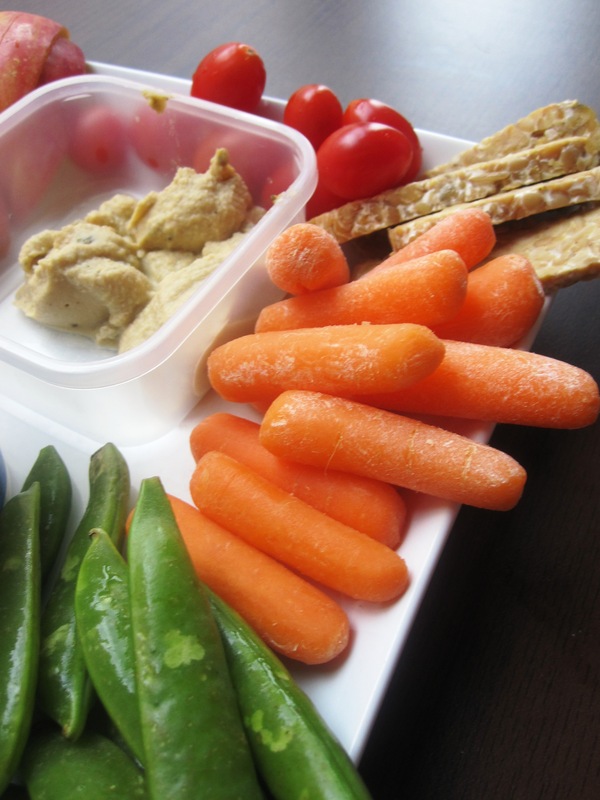 I also like snack plates full of veggies and delicious food, yours is just perfect! Snack; 0% fat Greek yogurt mixed with a little peanut butter and topped with half a banana sliced. Almost like dessert! My Favorite lunch at the moment is kidney beans and brown rice and veg stirfry. I made lots and I keep reheating it in parts for lunch. I love the look of your snack plate. Yum! Thanks for posting this! This is such a great idea. I now want to try it! I love everything that’s on your snack plate, but I’d add some cheese, sliced cucumbers and peanut butter! My favorite lunch lately has been tortilla pizzas! It is a bit ridiculous how many days in a row I have eaten that! Lol. Snack plates are the jam! I love carrots, cauliflower, snap peas with hummus. Sometimes I do celery and pb with apples. I always involve a cracker of some kind too! Right now I am loving TJ’s Raisin Rosemary Crisps! I’ve been drowning myself in smoothies lately but these snack plates do look tasty. I think I’ll do both tomorrow. Self Hosted & New URL!